Do you want to work for yourself, be your own boss on your own schedule, and travel the world? Do you want to receive recurring payments to your bank account while you are sitting on the beach in Costa Rica? Well, anything is possible if you can get beyond the limitations that have been placed in your mind by yourself or others. You can become the traveling entrepreneur of your dreams. You are capable of much more than you may think. I am a traveling entrepreneur. This did not happen by accident. In fact, I designed my life in a way that allows me to make money so long as I have a laptop and WiFi. I went to school for graphic design and after graduating, I realized that you can’t necessarily make the living that I was aspiring to as a graphic designer alone. Of course this was not the story that was sold to me by the enrollment counselor. Post-graduation, I was disconcerted by the job market but I decided not to allow these circumstances to shape me or my path. While in college, I developed an interest in web design and development. I also launched the now cycling apparel brand, Heavy Pedal, during my time as a student. We had the site developed via WordPress by a friend who left it up to me to maintain. Since I enjoyed web design and development, I took it upon myself to treat working on the website like it was playing a video game. This not only made it fun, but it also allowed me to become a more well-rounded web designer and developer in addition to my background in graphic design. I was learning more in order to become marketable to a wider field. After graduating from college, I entered the job market and found work as a graphic designer with web capabilities for other companies. After years of working for a boss, I eventually decided to branch out and create a web design and marketing company of my own called Brand Overture. When I launched this company, I promised myself that I would consistently over deliver. This commitment has lead to clients speaking very highly of my company and in turn, has lead to constant word of mouth referrals and long-term working relationships. In order to do graphic design or web design, the only tools you need for work are a computer and access to the internet. 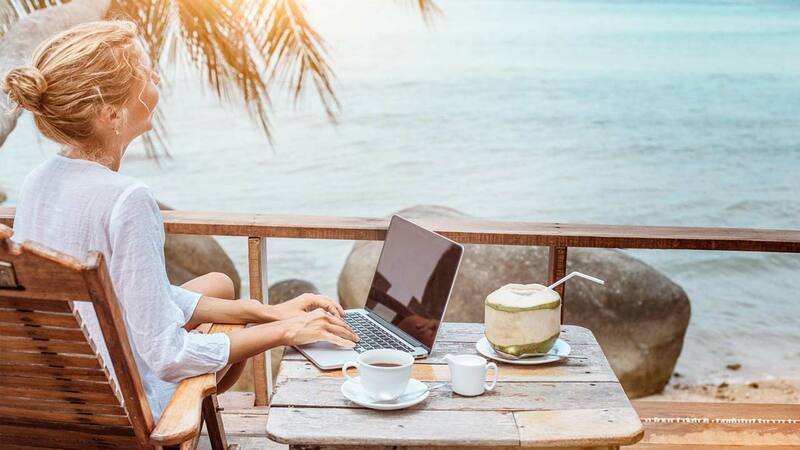 Once you go from having a boss to being your own boss, you realize that you can work remotely from almost anywhere in the world. I am not always on the go but I travel as often as possible. Some of my favorite international destinations include: Indonesia, Chile and Peru. What will your destination be? When I travelled to Peru, I encountered sloths, anacondas and monkeys in the rainforest. I went on boat rides up and down the Amazon river. I experienced a 5-day backpacking trek through the Salkantay Mountains and the Inka Trail. We journeyed through several different microclimates; it was incredible. At the end of the backpacking trek we visited Machu Picchu and climbed Huayna Picchu as icing on the cake. It was a life-changing experience to say the least. This trip was about three weeks long, and I was able to come in and out of WiFi to oversee my clients, my personal work and Heavy Pedal. When I arrived home and checked my bank account, there was a surplus of money in the account that was all earned while simultaneously traveling. I am not saying this to boast, I am letting you know from my first hand experience that it is possible. We have an aversion to discussing financial success in our society. I think the more we openly discuss this topic, the more it might inspire others to believe that they can do it too. Look, I understand that you might not be a designer or developer. You don’t need to be. There are a multitude of ways to make money online. For example, people sell shirts using a Shopify eCommerce site with a plugin app called Printful that prints and ships the garments that you sell. No overhead required. I can go on and on with different opportunities to make money online. The first step is to visualize in your mind that you can do it, get an idea of what you want to do and then take the steps to make it happen. If you need help to narrow down what to do or how to do it, I am here to assist you in making your own version of freedom become a reality. Just reach out. Be sure to also sign up for the Self Champ newsletter to become a Champion Insider. I will update you about new blog posts and will be sharing tips and tricks for aspiring Entrepreneurs just like you.